Munich - A transfer to UEFA Champions League participants Bayer 04 Leverkusen appears to be just the platform that needs to establish himself as one of the Bundesliga’s top goalscorers. 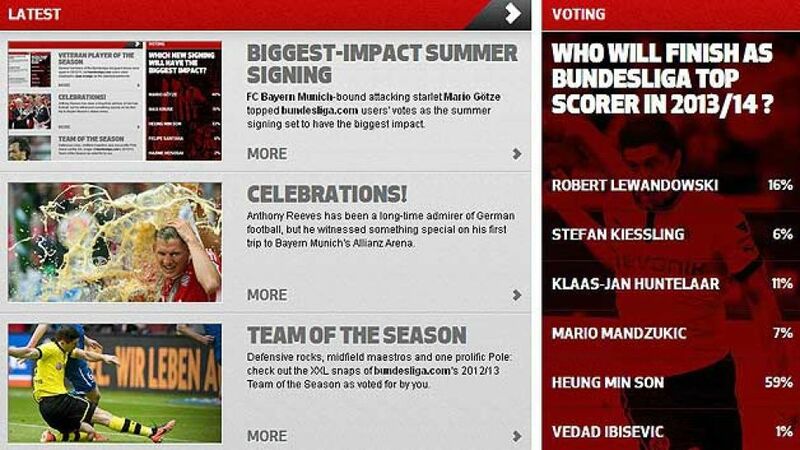 At least that seems to be the view of the bundesliga.com users, who have voted Son to be the top scorer in the 2013/14 season, ahead of 2012/13’s leading marksman Stefan Kießling and Borussia Dortmund striker Robert Lewandowski, among others. Schürrle wasn’t the focal point of the Leverkusen attack in the season just ended. That role was played, and outstandingly so, by Stefan Kießling, who ended 2012/13 with 25 goals and the award of the Bundesliga's top goalscorer. However, the vast majority of voters (59 per cent) believe Son will usurp that title from Kießling, who received just six per cent. The 20-year-old may not replace Kießling as the nominal leader of the attack, but playing in a more attacking side than Hamburg could well see him beat his season-best tally of 12 Bundesliga goals. Dortmund’s Lewandowski netted 24 goals last season, being pipped to the top goalscorer award by Kießling on the final day of the season. The man who struck four in a single game against nine-time European Champions Real Madrid in April this year is likely to be there or thereabouts come the end of next season when the goals are totted up. He received 16 per cent of the vote. The Pole was third on the goalscorer’s list in the 2011/12 season, which was won by FC Schalke 04’s Klaas-Jan Huntelaar with 29 goals. The Dutchman had a less productive 2012/13 campaign, hitting the net just ten times, but eleven per cent of voters sense another fruitful campaign for the former AC Milan striker, preferably free of injury. A modest seven per cent see FC Bayern Munich’s Mario Mandzukic winning a maiden Torjägerkanone at the end of the 2013/14 season, while VfB Stuttgart’s Vedad Ibisevic has an outside chance with one per cent of the vote.